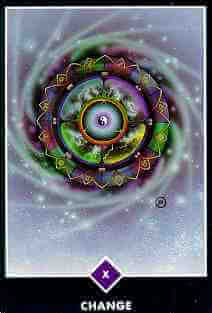 Meaning of the Card: Life repeats itself mindlessly–unless you become mindful, it will go on repeating like a wheel. 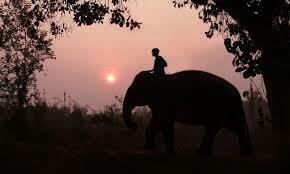 That’s why Buddhists call it the wheel of life and death–the wheel of time. It moves like a wheel: birth is followed by death, death is followed by birth; love is followed by hate, hate is followed by love; success is followed by failure, failure is followed by success. Just see! If you can watch just for a few days, you will see a pattern emerging, a wheel pattern. One day, a fine morning, you are feeling so good and so happy, and another day you are so dull, so dead that you start thinking of committing suicide. And just the other day you were so full of life, so blissful that you were feeling thankful to God that you were in a mood of deep gratefulness, and today there is great complaint and you don’t see the point why one should go on living…. And it goes on and on, but you don’t see the pattern. Once you see the pattern, you can get out of it. Commentary on the Card: The symbol in this card is an enormous wheel representing time, fate, karma. Galaxies spin around this constantly moving circle, and the twelve signs of the zodiac appear on its circumference. Just inside the circumference are the eight trigrams of the I Ching, and even closer to the center are the four directions, each illuminated by the energy of lightning. The spinning triangle is at this moment pointed upward, toward the divine, and the Chinese symbol of yin and yang, male and female, creative and receptive, lies at the center. It has often been said that the only unchanging thing in the world is change itself. Life is continuously changing, evolving, dying and being reborn. All opposites play a part in this vast circular pattern. If you cling to the edge of the wheel you can get dizzy! Move toward the center of the cyclone and relax, knowing that this too will pass. Fasten your seatbelts, people, we are in for another week of Ch – ch ch – changes! 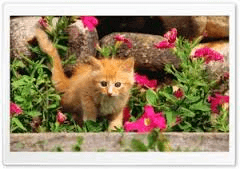 Staying neutral, centered, and in a state of welcoming acceptance of the freshness that change brings will keep the scardie-cat feelings at bay. Need some extra help staying centered and calm? A Reiki or counseling session may be just the ticket. 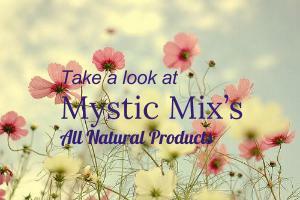 You can reach me at: Laura@mysticmix.com, or on my cell at (801) 366-4469. Peace.